Could end up a replay Penc. Be fun sitting in that open stand midweek in the rain. Good support that, long trip from t’other side of the Capital. Must be staying over a lot of them. Money in local coffers there. Yep, more the better, all to stay over, spend every penny have a great day out....then they can dissapear just as quick having had fck all to shout about. Apparently? Have they done this or not? Should have done a family ticket for a tenner. Get them in. But that would depend on Gillingham agreeing I guess. There is a promotion for local kids football sides to attend ‘Come With Your Club’ it is called. There are even more discounts with this offer. My source tells me that over half the tickets are sold. So with walk ups etc there should be a decent atmosphere. About 800 have taken the cheap hospitality package. Come on builthy your slipping, exact number please. If we don’t take this game seriously, has cup upset written all over it. They've got to play well above themselves whilst no matter what team we put out, have to play pretty poorly. I can't see both of those happening at same time, plus being at home, I can see us edging this by 1 or 2 goals. Very sharp - but possibly true ! Good effort that.I haven’t got round to buying yet but assume there’ll be stacks left tomorrow. 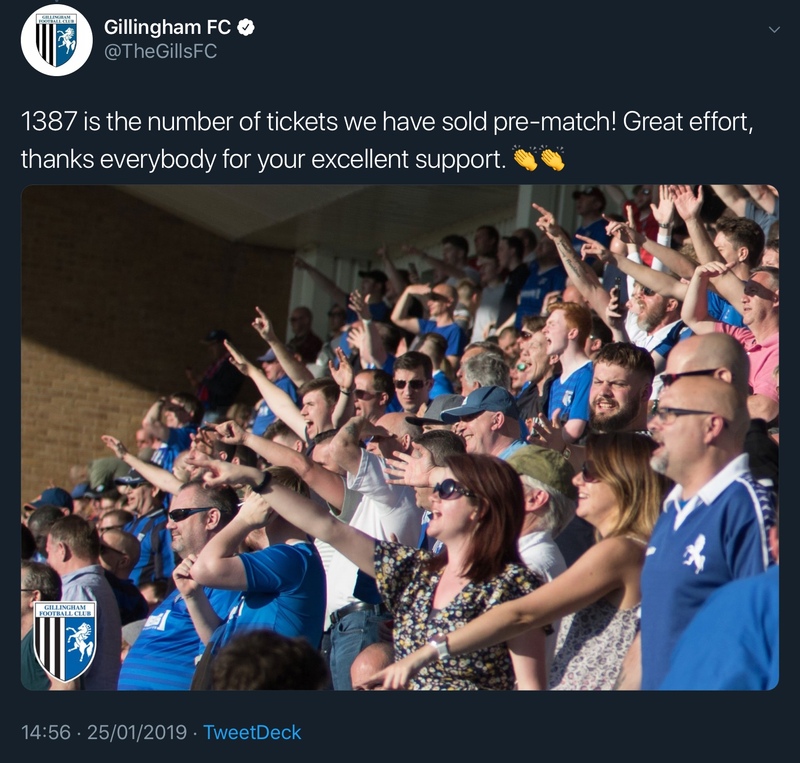 Funny how when we play United tickets are like gold dust, but when we play Gillingham we’ll be half full. Almost like the ground’s clogged up with tvvats who don’t go to see us play innit? I'd love a Wembley win in may for us, the 30000 odd fans we'd take. Be even happier if the sell out scum were told not to be at Wembley as dibble couldn't guarantee their safety. Don't like a divided club and the sooner beaky, shagged dimwit and the rest go, the better. 3000 more than I thought would be there. Cracking turnout. A lot of walk ups. 15000 crowd very good. Potter is taking the cup seriously. 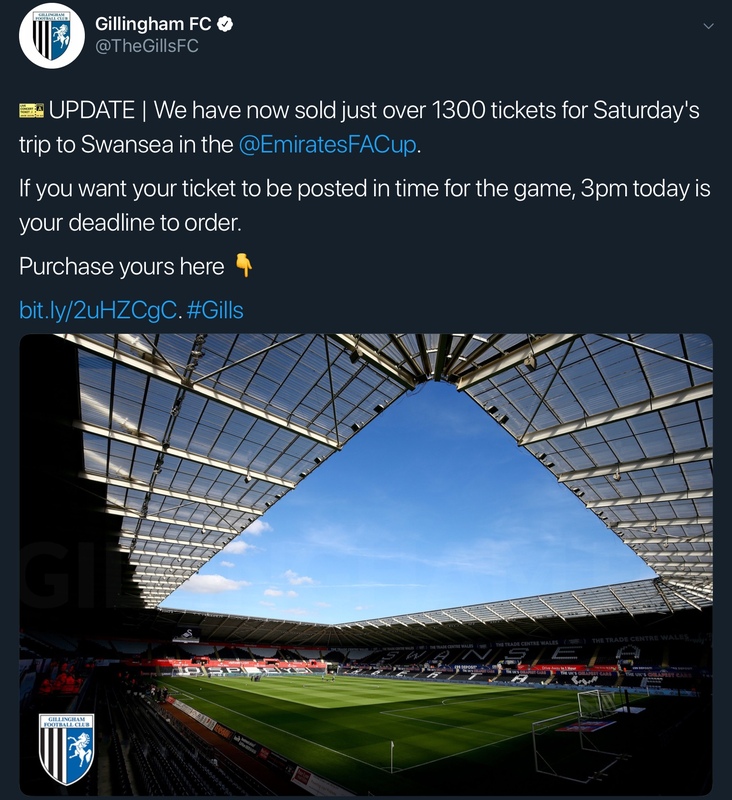 If we get a home draw let's fill the ground. After all, if we get to the semis you will all want to be there.